It was just two weeks ago that we broke the story that the TPP was signed by the 12 signatory countries and is now speeding towards ratification. The agreement would be a significant blow to civil rights in any country that ratifies the agreement. 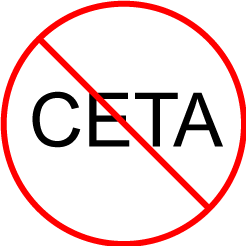 Now, reports have surfaced that CETA is now “virtually complete”. As we noted earlier, CETA would, among other things, force anti-cricumvention laws onto other countries, bring in site blocking, allow for statutory damages for non-commercial infringement, and force border security to destroy your cell phone if they find copyright infringing material on it. The legal scrub of the Canada-European Union Comprehensive and Economic Trade Agreement (CETA) is “virtually complete” and the current timeline suggests the deal will be implemented in early 2017, Canada’s chief negotiator — Steve Verheul — told the House of Commons international trade committee Tuesday morning. After the agreement is fully translated into all of the EU’s languages, which Verheul expects to be done by May, the agreement will go to the Council of the European Union for ratification before it’s signed and put to the European Parliament for a ratification vote. To be fair in this, the agreement has seen significant delays in the past. There’s no telling for certain that this deadline is for certain at this point. After all, back in 2013, we’ve seen reports that suggests that CETA was weeks away from completion only to see follow-up reports just days later say that the agreement may be delayed. Three years later, we’re now seeing word that the agreement is practically complete again. If the May deadline is to be believed this time around, then signing off on the agreement wouldn’t be far away after that. A major problem for civil rights in all of this is the timing. Already, there are battles to stop the ratification of TPP right now. Some of these battles are seen on the streets where protests are being held both in the US and around the world. The threat here is that if the ratification process is happening of multiple trade agreements, opposition may be divided between those who are opposed to CETA and those who are opposed to TPP. In the past, when ACTA was being proposed, civilians in numerous countries coudl air their grievances toward one agreement. When SOPA (Stop Online Piracy Act) was being proposed in the US, US citizens could focus their anger and outrage to stop it. What happens when mega corporations try a multi-pronged approach by trying to push through multiple “trade” agreements at the same time? Even if one agreement gets pushed back, another trade agreement could easily be pushed through in the mean time. As it stands now, fighting even one of these agreements is going to be a tough uphill battle, let alone two. One thing is certain, the will of the people to preserve civil rights in their respective countries is going to be tested – and it’s not going to be an easy test.